Sefer Torah procession will pass at the heart of Tel Aviv on the way to Ateret Mordechai shull • police: "do not remember such a parade in the center of town"
For the first time, today (Wednesday) Arlosoroff Street in Tel Aviv will be closed to traffic due to a Sefer Torah procession of the Congregation Ateret Mordecai in the city. At the head of the local community is Rabbi Aharon Deutsch and the shull is located next to Rabin Square in Tel Aviv. The shull has been in an upsurge of activity during the last years, and centers around it veteran religious and haredi families, along with many ba'alei tshuva families and newcomers. During the event an informational page entitled "Why We Celebrate" will be distributed, in which it will be explained to the secular why this celebration is taking place. Last month a group of bochurim from the yeshiva of Rabbi Potash in Jerusalem "Chachmei Yerushalayim" started studying at the place. The group of learners, led by their rabbi, Rabbi Ephraim Miller, added much to improve and disseminate Torah in Tel Aviv. The parade will leave at 18:00 from 23 Be'eri Street, from where it will pass on to Weizman Street near Ichilov Hospital and then to Arlosoroff Street, near the building of the Histadrut and Kupat Cholim Clalit until it reaches the shull. 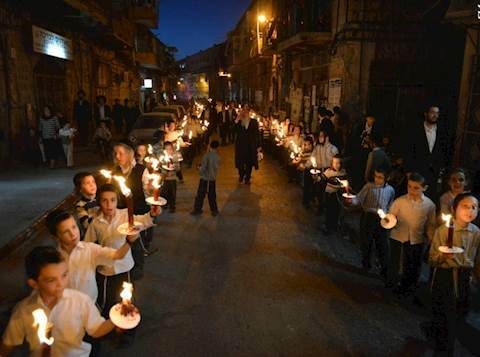 Children of the Belz Talmud Torah in Tel Aviv will accompany the procession. Police say they do not remember such a procession to accompany the heart of the city for many years.